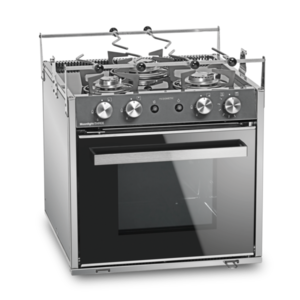 This affordable, high quality gas oven with grill and three-burner hob is the ideal all-in-one cooking solution for any mobile kitchen. Cooking, baking and grilling on board? Dometic gives you a choice of fully fledged gas stoves with a grill inside and a hob on top. This elegant model impresses with a mirror-polished glass surface. 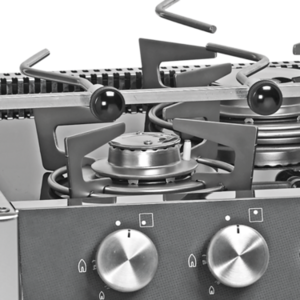 It comes at an affordable price and gives you the same cooking convenience as a domestic gas stove: fast heat-up and precise flame regulation. 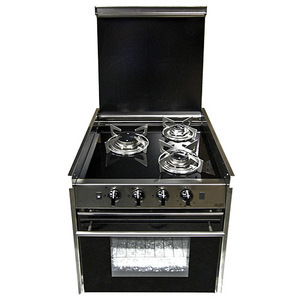 High quality affordably priced, the Dometic MoonLight Three gas oven with grill and three-burner hob provides an all-in-one cooking solution for motorhomes and caravans. It boasts a heat-resistant glass door and interior light for easy viewing of what’s cooking. For safe use, it offers an oven door safety lock and safety ignition system. With its oven, grill and three-burner hob, it’s a neat oven that meets all cooking needs while travelling.